The first week of April has always been a busy one in Azeroth! Blizzard traditionally spends at least one day each week rolling out some bug fixes, or “hot fixes” as they like to call them, to separate them from traditional updates. April 3rd, 2007 was focused on fixing some pathing exploits. No longer could players exit the bubble in Eye of the Storm before triggering the match and gaining an unfair advantage. They also fixed an exploit where a player could use the Auto-unstuck feature as basically a Eureka effect. Now there’s a 1-hour cooldown for using the feature. Likewise, the gate at the top of the elevator in Mechanar will now remain open while attempting the gauntlet and after Pathaleon the Calculator is killed. This is great for speedrunners, as Methanar was always considered a free XP farm since a moderately-equipped team can easily chow through the first floor even on Heroic mode. April 1st 2008 saw a number of tweaks to the Combat log to make it more memory-friendly. Only the last 300 logs are now saved, and changing zones no longer reloads the entire log. The patch had been intended to also fix filter settings not being properly saved, but this fix was pulled at the last minute. April 1st 2009 saw the relatively-new Rune of Razorice get hit with a decent nerf; no longer could it trigger the guarenteed crits of Killing Machine, which was probably never intended in the first place. As a consolation, its debuff was also made impossible to dispel. Seven days later, Silent Fang received a similar fix regarding its chance to trigger silence. April 2nd 2010 saw a fix to the Strength of the Earth Totem, which was supposed to behave like D&D’s Haste but wasn’t triggering the agility bonus on teammates. This gave it some good synergy with a number of builds, especially Warriors as it increased the amount of damage their shield can block. In WoW-speak, 2012 was the Year of the Panda, and the third build of the Mists of Pandaria came out on April 6. Unfortunately extended maintenance on the beta realms meant most people couldn’t try out the new stuff until at least the next day. 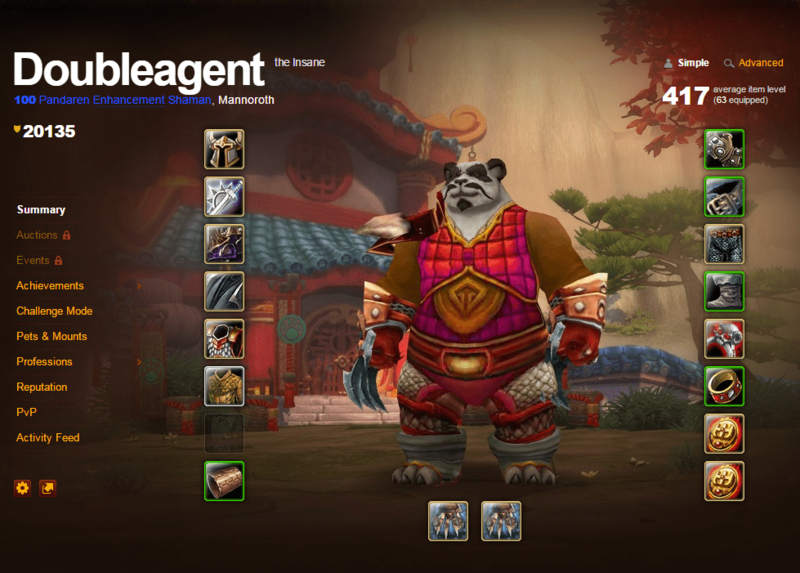 Doubleagent, seeing that Pandaren begin the game neutral, starts on his quest to have the first and only max-level character unaffiliated with either Alliance or Horde. He finally reached Level 100 in March 2015. Speaking of betas, 2013 saw the unveiling of the Public Test Realm, and its fourth patch saw the light on April 4, 2013. Monks, Priests, Shamans and Warriors were on the menu today, with the first three seeing minor buffs to their combat capabilities and the latter getting hit with the lightest of Defensive Stance nerfs. In the main game, the quest “Extended Shore Leave” gets removed from standard rotation due to an unstated issue with the Zandari Warship. It might have been the visual bug where Zandari beast handlers wouldn’t properly sit on Direhorns, that got fixed four days later. The Blue Dragon card received a chance to not activate its effect for players above level 61, intending to act as a sort of stoppage valve against infinite mana regen. There’s a pretty extensive list of patch notes here, it was quite a week. Last update of this week was April 7, 2014, where Blizzard fixed a very annoying bug with the Lesson of the Burning Scroll quest, where players who accepted found it very difficult to obtain the plot-relevant Master’s Flame. Now it just gets automatically added to your inventory. All world bosses in Mists of Pandaria stopped being tap-to-faction, letting both Horde and Alliance players (but not Doubleagent) be eligible for loot. The amount of allowed instances for each WoW account increased from 10 to 5 due to an increasing complexity of quests and simple hardware advancements. As a quest writer/implementer on an MMO that can only handle a single instance per player, I felt a tickle of jealousy when I read that. And now it’s 2015, and this week doesn’t appear ready to settle down just yet. Blizzard has announced at least two events coming to you soon. The Darkmoon Faire begins on April 5th, letting players celebrate the wonders and mysteries of Azeroth from the safety of accessible portals in Mulgore and Elwynn Forest. Hope you’re not too sleepy after that, because the very next day the great feast of the Noblegarden begins at participating locations. Eggs painted like wildflowers will be hidden around the arena and players are encouraged to scavenge them to obtain chocolate, coins, and other treasures. Who knows what else lies in store?